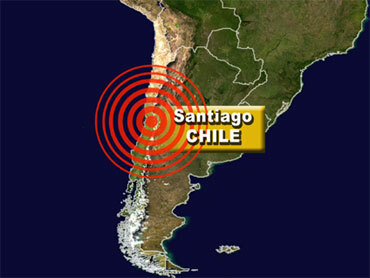 SANTIAGO, Chile - A magnitude-7.1 earthquake shook southern Chile on Sunday, prompting tens of thousands to flee the coast for higher ground amid fears it could generate a tsunami like the one that ravaged the area last year. The Pacific Tsunami Warning Center in Hawaii also said a destructive Pacific Ocean-wide tsunami was not expected. President Sebastian Pinera urged calm in an address to the nation. "There was an exercise of self-evacuation, which is exactly what we have asked people to do," Pinera said. "Fortunately we do not have to lament accidents or losses of life." Some cell-phone communications and electrical power were knocked out in the Araucania region where the quake was centered, 370 miles south-southwest of the capital, Santiago. The U.S. Geological Survey said the epicenter was about 45 miles away from the provincial capital of Temuco, which has a population of about 250,000. The quake struck at a depth of about 11 miles, according to the USGS, and there was at least one aftershock of 5.0 magnitude. When the first temblor struck, people in several coastal cities quickly moved away from the ocean, abandoning some shopping centers entirely. Hundreds of tourists spending the New Year's holiday at the resorts of Villarica and Pucon cut their trips short and headed north, clogging roads and toll stations. Residents of the region have fresh memories of the magnitude-8.8 quake and resulting tsunami on Feb. 27, 2010, that killed at least 521 people and left 200,000 homeless. Sergio Barrientos, director of the seismology office at the University of Chile, said Sunday's temblor was itself an aftershock of last year's mega-quake.